First cut a 5 3/4" piece of purple card stock and fold it in half for the base and a 4 1/2" x 5 1/2" piece of white for the front layer. Then heat emboss the Corner Garden image on white card stock with Versamark ink and black embossing powder then color the flowers with an aqua painter and Stampin' Up! Elegant Eggplant, Tempting Turquoise and Garden Green ink pads. Allow to dry completely. 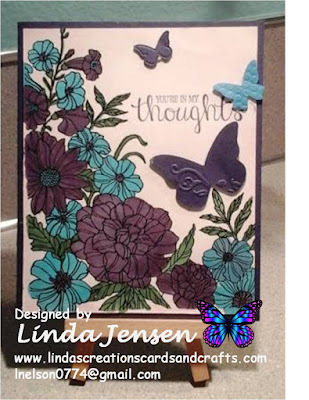 Meanwhile create the butterflies with the Beautiful Wings Embosslit then using a stamp positioner, stamp the sentiment with a stamp from the Best Thoughts stamp set in Elegant Eggplant ink. Finally attach the butterflies with mini pop dots, finish assembling the card and enjoy!